The VFG Fabric Resource can be used in various ways. If you want to look up a fabric or fabric term, you can look it up by its name in the Fabric Resource A-Z. If you are trying to identify a fabric, there are several ways to start your search. It is very important to distinguish between fiber and fabric. The fiber is what the fabric is made of, either natural or manufactured, staple or filament. The fabric is the finished product. For help identifying the fiber, go to Determining Fiber. For help finding the name of a particular fabric, the fabrics are grouped into categories in three ways: 1. Fabric Looks Like 2. Fabric by Fiber and 3. Fabric by Use. The Fabric Looks Like categorization is a first impression concept for identifying fabrics. If your fabric is light, but there isn’t anything particularly pronounced about its look or texture, check Light to medium weight fabrics. If it is ribbed, are the ribs horizontal, vertical or diagonal? Check the ribbed category that fits. In some cases, fabrics fall into more than one category; try starting with what you think is its most noticeable aspect. If you have little or no experience with fabrics, this may be the best place to start your search. If you have clearly determined the fiber of a fabric, you can check the Fabric by Fiber groupings. Keep in mind that these are fiber families. For instance, in the wool category you will find fabrics that resemble or are related to wool fabrics, such as an acrylic ribbed knit. If a fabric is a blend of two fiber families, it is most likely to be in the category of the more prominent fiber. There are a number of natural fibers not represented in these lists simply because there are relatively few specific fabrics made of these fibers (such as hemp and ramie). There are no manufactured fibers that have their own heading because all the manufactured fibers are manufactured to resemble natural fibers. Finally, you can search for fabrics by the type of clothing (or parts of clothing and accessories) in the categories under Fabric by Use. For example, if you are trying to identify the fabric used for a winter coat, begin by searching the Heavy Weight category. These are broad classifications, and some fabrics (muslin for instance) fall into more than one category. Included in the Fabric Resource are glossary terms, and many of these will be reached by a link when they come up in a definition. They can also be searched in the Fabric Resource A-Z list. You can browse thumbnails of all fabrics by going to Fabric. You can browse all fabric glossary items by going to Fabric Terms. Finally, the Fabric Resource is a start, not a finished product. It is the hope that it will continually grow with basic fabrics and, especially, with intriguing vintage fabrics—rare, obsolete, and just plain interesting. We provide the VFG resources at no cost to the vintage community, and we are pleased when people find them useful. However, all materials contained in this website (including text, images and the design of the site) are VFG’s copyrighted property. We authorize you to copy small portions of text (fewer than 75 words) for use on another site (such as eBay), provided that if you do so, you credit VFG in the following way: “Information courtesy of The Vintage Fashion Guild”, or “Information courtesy of Contributor’s Name/the Vintage Fashion Guild.” To reproduce any images or to reproduce more substantial excerpts of text, you must first obtain our prior written consent. 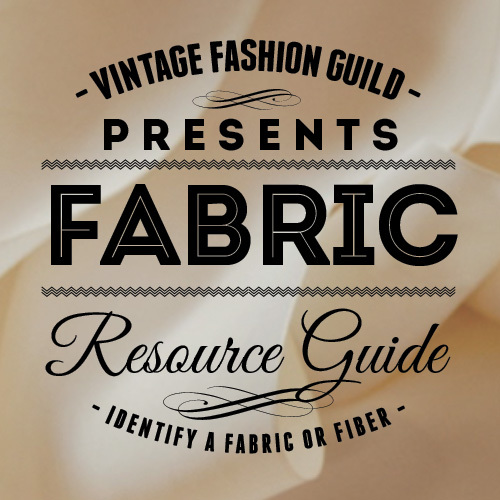 Vintage Fashion Guild™, VFG and The Vintage Fashion Guild Label Resource™ are our trademarks and may not be used in connection with any product or service not provided by us in any manner that is likely to cause consumer confusion or in any manner that disparages or discredits VFG. All other trademarks displayed on our website are the trademarks of their respective owners and constitute neither an endorsement nor a recommendation of those trademark owners. In addition, such use of trademarks is not intended to imply, directly or indirectly, that those trademark owners endorse or have any affiliation with VFG.